I was asked late last year by Miad to leave a review which I didn't do because I knew it wouldn't be positive but looking at the reviews left I feel I should give my experience to balance things out. I joined the 3 month spec program as I was looking for a better understanding of fundamentals having spent 4 years concentrating on technical analysis, the program its self teaches you nothing there are sections on oil, monetary police, interest rates etc but each section for the 3 months tells you to go and read up about them your self and recommends wikipedia and baby pips. There are some price action courses as well but each course just shows 1 or 2 trade examples with no more than a paragraph of writing about it. I wanted a copy of the COT spread sheet but you had to be an annual subscriber for that so I paid just to get the sheet which overall is very good but soon noticed theres another educator out there with almost the exact same one which they claim to have developed them selves. Who knows? My time in the room was very confusing Miad would say buy X currency pair and then you would see him re-tweet someone on Twitter saying sell the same pair. They would also tweet things that happen in the room that never happened once, I got into a heated discussion about that as it was totally misleading to people that would see the tweet. Leo is a nice guy and I really liked him but overall my time in the room I was massively down financially, taking two big hits one on usdtry we was told to enter with no stop as it was a long term play this trade was never mentioned again until I sent a message questioning it when it was heavily under water had I not questioned it and closed for a bigger than usual loss the hit would have been very damaging. Same with a gbpaud its had a good run up then when the markets opened on Sunday Miad said in the room don't even question it buy now it's going to RIP, it came down well over 300 pips, again the trade didn't get another mention. I left the room 2 months into my 12 month subscription as almost every day I was left in total confusion couldn't risk losing anymore than I had. This review is miles away from others here and what is portrayed on Twitter but it's my own honest review of my time there. I understand some people might be happy to sign up for an education service only to be told you need to read up on say oil a good start is wikipedia or babypips these are free sites. Think about that you pay someone to tell you to go to free websites and figure it out for your self. I think the review below was kind about the price action course, maybe something got lost in translation but a course they are definitely not. The way miad talks about trades will leave you thinking does he mean buy or sell? Or wow this must be a great trade, unfortunately not i lost money on most of their calls only to see miad boasting on social media how well hes done. Certainly nothing you can find free anywhere else. No one explains and teaches market logic like they do. I think they layout and format could be a touch improved. But their market views are always spot on. Well worth the money I re-subscribed for an annual subscription ! Very genuine guys with a lot of experience and knowledge between them. Superb fundamental analysis by Miad combined with Leo’s amazing coding skills! Indispensable tools for success in Trading. Speculatorstrading.com changed the way I run by business...I've dabbled in Markets for more than 15 years. Options, FX, and a little Futures. I manage my own accounts. That's been my primary income for the last three years. I've been through the gauntlet of system hopping and finally came to the understanding that there is no Holy Grail. Once I discovered Supply and Demand trading, my executions got better. I see now that the grind doesn't go away, it just changes. The "mature grind" is information processing, not learning how to trade. That's where Speculatorstrading.com is critically important for me. I learned the skills needed to map the drivers of markets, what moves supply and demand. Essentially, I'm saying start with your technique technique, but the specstrading process tells you how and when to use that technique. I still have some losses, but the gains are on a different level now. I can't thank them enough for their invaluable service and education. Specifically, you will receive a 12 week course in Speculating, in addition to training on Advanced Trading Skills, Sentiment Analysis, Volume Spread Analysis, Supply and Demand, Price Action. I traded for years only using technical analysis before stumbling on specs trading. Like anything, don’t expect to walk in and be a master fundamental analyst — instead listen to the logic provided each day in the room and steadily wrap your head around major concepts. Make friends to learn with. Keep on it every day and one day you’ll wake up and it will all make sense. Your account will thank you. Excellent course, great value. Highly recommended. As traders we seek to understand how price moves and what moves it. 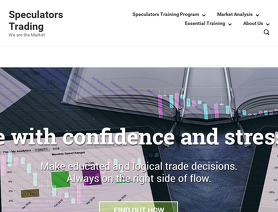 Speculators Trading course helps you understand the latter in a very well organised and structured approach. Excellent course that offers great value. Highly recommended. Have been trading TA and PA trading for over 5 years now with mixed success and never bothered with FA until I came across Speculators Trading. After only half the way through their 12 week course I feel more positive and confident than I ever have, I am now beginning to understand the "why's and what for,s" of why an asset is moving in any particular direction. There training in supply and demand, volume analysis and sentiment have been invaluable tools, this game is by no means an easy battle but I now feel that I have got specs trading by my side its one that can be won. I have been trading stock markets for 10 yrs & wanted to try my luck in Forex markets.I spent lot of time attending seminars,videos tutorials but it wasn’t that easy.Prices can change at incredible speed in response to news and global events and the trick is to see ahead and prepare yourself for it.Speculatorstrading.com is a fantastic platform where I learnt what makes price move,suppy/demand,managing risks and how to avoid making errors.Miad and Leo are wonderful mentors always at help.Regular updates,trading concepts,technical and fundamental analysis to keep you on top.Highly recommended.